In Autumn 1933, a famous young(ish) novelist visited the North East of England, full of cold and cold medicine and missing his home. 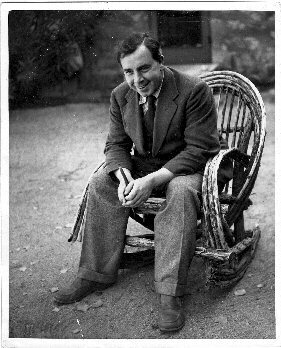 J.B. Priestley was travelling around England’s regions, making the observations that would become one of his most significant publications: English Journey. The sections of English Journey on Newcastle, Middlesborough and the North East of England are among the most powerful parts of the book. Priestley pointed unforgettably to the devastating impacts on landscape and people of “greedy, careless, cynical, barbaric” industry. He also said bluntly what he thought of the locals (“I had never seen a crowd of men whose looks pleased me less”) and their accent, a “most barbarous, monotonous and irritating twang”. 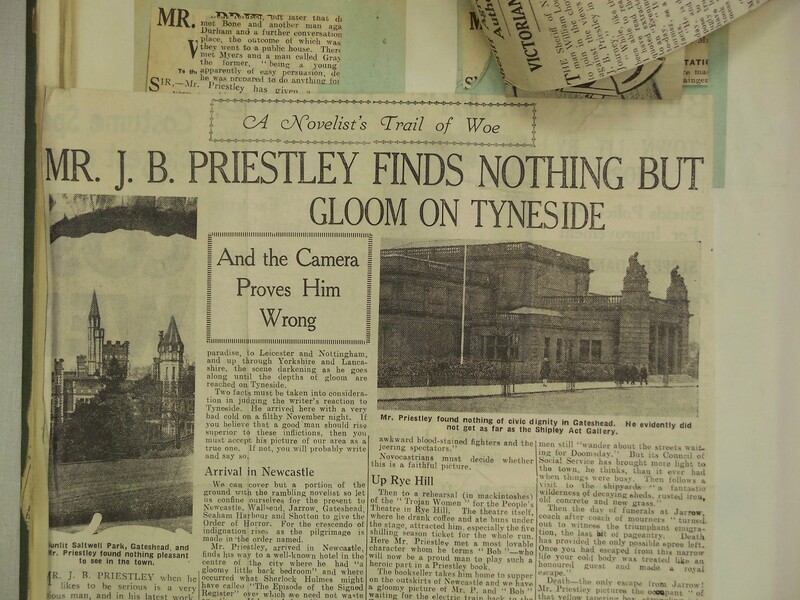 A scrapbook of press cuttings (now part of the J.B. Priestley Archive) shows how passionately people felt about Mr Priestley’s take on their region, which whatever its faults was theirs, not his, a prosperous, wellconnected man briefly visiting and criticising what he saw: “This is not a dismal place!” cried one Middlesborough newspaper. In 2014, academics and journalists and other readers, like ourselves, are revisiting the book, seeing it in context, examining its impact, see for instance J.B. Priestley Society’s recent conference. In my talk at this conference I used the scrapbook to explore the marketing of English Journey and how it was received by its original readers. The response to the 80th anniversary by local media in the North East has much in common with the reaction in the 1930s, picking out his strong criticisms of individuals as well as his social commentary. Witness this article on the local BBC website and a piece on the local Look North (available online till 7pm on Friday 28 November 2014), both featuring the scrapbook and other contributions from Special Collections. Chris Phipps, a local historian interviewed for these pieces, will go beyond the headlines about Priestley and English Journey in a talk at the Newcastle Lit and Phil on Saturday 29 November 2014. “I stared at the monster, my head tilted back, and thought of all the fine things that had been conjured out of it in its time, the country houses and town houses, the drawing-rooms and dining-rooms, the carriages and pairs; the trips to Paris, the silks and the jewels, the peaches and iced puddings, the cigars and old brandies; I thought I saw them all tumbling and streaming out, hurrying away from Shotton – oh, a long way from Shotton – as fast as they could go”. Volume 10 of the J.B. Priestley Society Journal is just out. It includes my article on the marketing campaign for the publication of English Journey in 1934, and how local newspapers and individuals responded to his candid comments about their towns. An early, unpublished story by Priestley, exploring a passionate love affair, transcribed and analysed by John Bennett. Michael Nelson on a new DVD illustrating Priestley’s involvement with the British documentary film movement via two films: We live in two worlds, about the General Post Office, and Britain at Bay, WW2 morale boosting. Alan Day on Priestley’s powerful anti-nuclear TV plays, Doomsday for Dyson (1958), and Level 7 (1966). The latter, dramatising Mordecai Roshwald’s novel, is described as “harrowing in the extreme, truly awe-inspiring”. Professor Kulkarni comparing Priestley to other writers on time. This Journal is available free to members of the Society. It is also available in a few libraries, including Special Collections at Bradford.